We are proud to announce that we have received a national Good Food Award for excellence in children’s food and nutrition. This has been granted by the Children’s Food Trust who are the leading experts in children’s food. This means you can be sure the food on offer at our nurseries is varied, nutritious and meets the national food standards for children. We want to make sure every child has the opportunity to eat well. Our achievement of this Award demonstrates that we are committed to providing healthy food and drinks for children. The Children’s Food Trust is on a mission to get every child eating well and believe that when children eat better they do better. We share that belief and want to make sure that the food we provide at our nurseries gives children the energy and nutrition they need to fulfil their potential. We hope that you share our enthusiasm for the Award and will see the benefits that good food brings to your children both outside and inside the nursery. 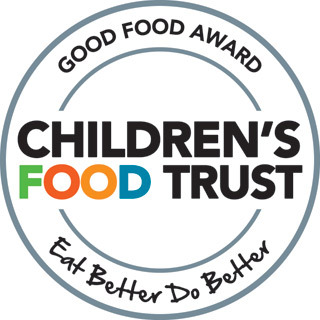 If you want to find out more about our award, please visit www.childrensfoodtrust.org.uk for more information.